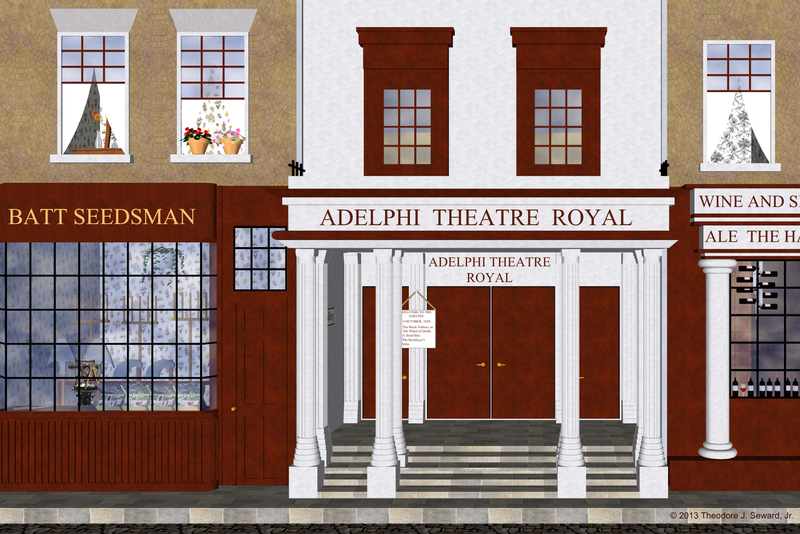 Due to the difficulty of seeing features in the c. 1830 sketch, I created a simulation of the Theatre's portico. TJS. In 1825, J. T. G. Rodwell died and was succeeded by his brother. George Rodwell and Jones sold the theatre in August to Frederick Yates and Daniel Terry who made changes to the building. The portico was screened by Doric columns with slender shafts standing on square pedestals. The front of the Adelphi showed it to be four stories high but only two windows wide. It was faced in stucco and surmounted by a triangular pediment and a chimney. The Hampshire Hog was in place at 410 Strand at least by 1822 to the right side of the Adelphi Theatre. They purchased insurance from the Sun Fire Office in 1822: "MS 11936/493/987872 30 January 1822 Insured: William Robert Burgess 107 Strand Other property or occupiers: the Hampshire Hog 410 Strand (victualler)." 2. 1. The printed version is found in F. H. W. Sheppard’s Survey of London, 36, The Parish of St. Paul Covent Garden. (London: Athlone Press, 1970), plate 64b.